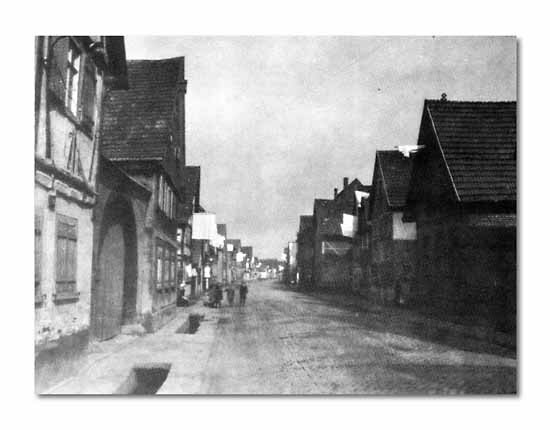 Bedsheets and pillowcases were hasty surrender signs in Herxheim and other conquered German towns. Village after village in the Reich presented this solemn, ghost-like spectacle to conquering T-Patchers rumbling over the ancient cobblestones of the Palatinate main streetsa white flag flying from every house, a few stunned, gloomy-eyed civilians watching the parade of Allied armor. 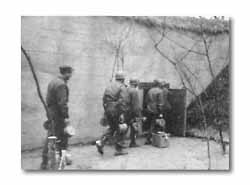 After each fresh entry civilians were ordered confined to their homes for 48 hours. Under non-fraternization orders, the Americansfor the first few days, at leastignored German wonderment and attempts to talk friendly-like to them. 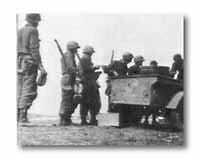 (Left) Troops line up for chow at a Rhine River outpost. 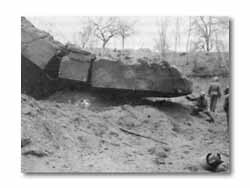 Engineers systematically destroyed . . .
. . . Each of the captured heavy fortifications.